I've been shopping at my local Fresh and Easy supermarket on 32nd Clement for over 6 months now and I just absolutely love this place. Before I discovered Fresh and Easy, my go-to supermarkets were Trader Joe's and Safeway. Trader Joe's is a bit out of the way but I go there for affordable natural and organic selections so the extra driving time was worth it. Safeway is actually closer to my home than Fresh and Easy but they are so much more pricey. Even with my personalized deals and coupons loaded to my Safeway card, I feel like I paid way too much for my groceries. You really have to be a savvy shopper when it comes to grocery shopping. Shop smart and spend less but don't compromise health at the same time. With Fresh and Easy, I do get my money's worth. I always walk out buying a lot more and paying less for them. More importantly, I don't have to compromise health over money because they have a very good selection of organic food. You know it's the insured type of organic because there's the USDA organic food seal on the packaging. The only other store supermarket chain that offers a wide range of USDA organic food is Whole Foods but they are so much more expensive. 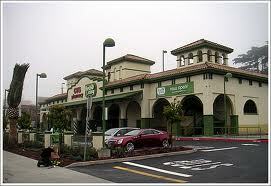 It's funny how I used to drive by Fresh and Easy everyday for years and it never occurred to me to check the place out. I thought it was just another regular supermarket store. Well one day, after I dropped off my daughter to school, I realized I had forgotten her class was having a mini party that day and I signed up to bring in juice. After I dropped her off, I swung by Fresh and Easy to buy juice. The first thing that struck me once I stepped into the store was the different layout. It was unlike Safeway and Trader Joes. There were a lot of bins and baskets for breads, fruits, and vegetables. I liked it right away. I was rushing that day so I didn't take the time to check out the entire store. The second thing that struck me was there were no cashiers. It was all self-checkouts. There was a store clerk overseeing the check out area. I told him it was my first time at the store and asked him to show me how to work this process which he gladly did so. Fresh and Easy has easily won me over with their low price and I love their coupons! Like Safeway, you sign up for a card. Unlike Safeway, you earn reward points towards your purchases which is awesome. Make sure you swipe you register your card either online or mail in. For every $1 you spend, you earn 1 point. You get $1 for every 100 points. After you hit the minimum of 500 points, you will receive an email notifying you that you have enough points to convert over to rewards. So for 500 points, you get $5 that you can redeem when you checkout. I love how the Fresh and Easy system works and I love how I much I save from using their coupons, personalized deals, and reward points. 1) I save a lot of money shopping here. 2) A lot of USDA organic food and juices to choose from. 3) I love their bi-weekly $5 or $6 OFF coupon that is mailed to my house. 4) I see how much my items are because I am scanning my own groceries. 5) I get additional saving from my personalized deals coupons emailed to me for items I buying often. I can scan the coupons directly from my phone so I don't need to print and cut the coupons out. 6) I get a specialized coupon emailed to me based on how much I spend at the store. Right now I get $14 OFF for every $70 I spend. 7) Fresh baked goods don't have additives and artificial ingredients. 8) There are many fresh not frozen prepared dishes where I can just pop in the oven or grill. 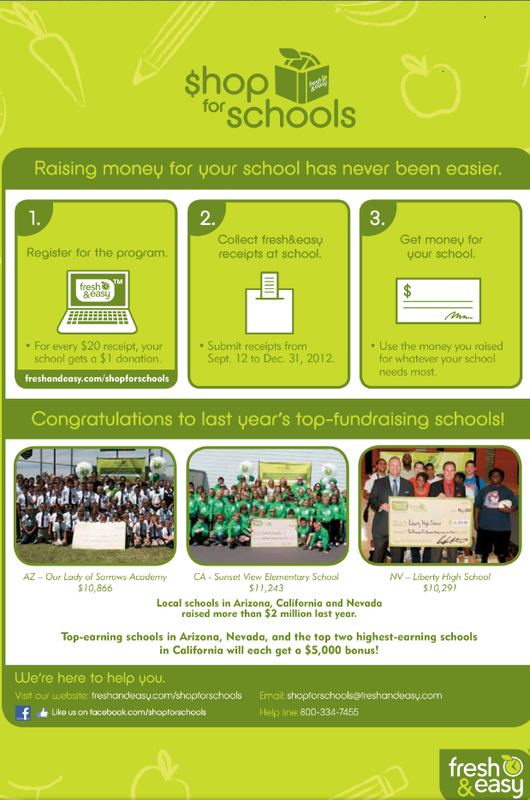 9) They have a Shop For Schools program that gives back money to local schools. 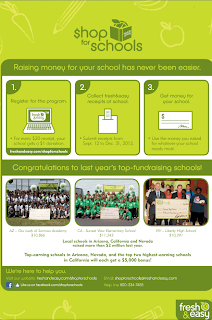 My daughter school signed up and her school received over $2,000. 10) I can combine all the coupons and rewards to save even more. On my last shopping trip, my total was $145. I scanned my $14 OFF for every $70 spent twice because my total exceeded $140 ($70+$70). I then scanned my personalized deals that was emailed to me. I purposely bought those items for additional savings. My total savings was $14+$14+$5=$33. I saved $33! Fresh and Easy did not pay me to write this post by the way. I wanted to share my savings tips with you and the benefits I received from shopping at this store. I hope I was able to give you some helpful insights about this store if you haven't shopped here before or have never heard about their programs.